Well, my Mother's Day didn't quite go as planned. First the little guy caught some type of virus that started as hives all over his body, then led to a really high fever that took all day to get down, followed by head congestion and lethargy. And he was even kind enough to pass his germs along to his father and I. I was not in the mood to do anything on Sunday. Which was fine, because it was my day to relax anyway. I did receive some lovely gifts from the hubby and kids, which made things better. 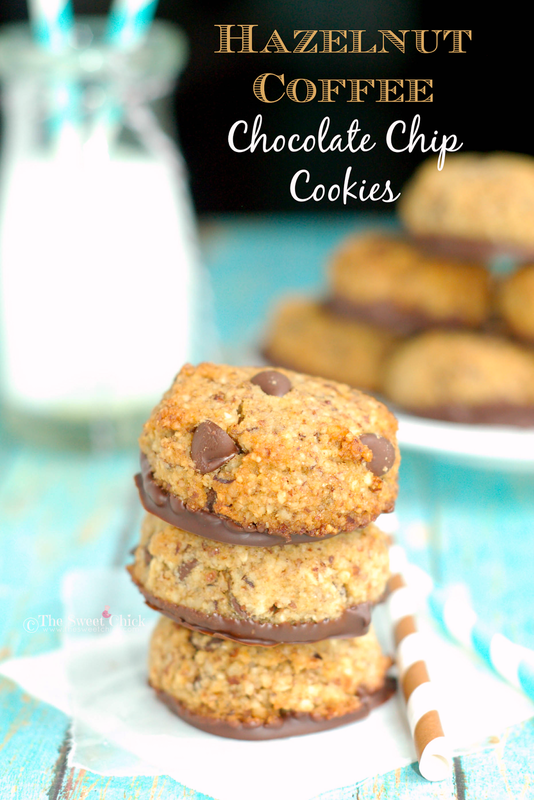 Kinda of like these Hazelnut Coffee Chocolate Chip Cookies made me feel when I first bit into one. They are truly spectacular. I am a big fan of the hazelnut/chocolate combo. I hope you are too, because these cookies are so easy to make. Mother's Day is coming up this weekend. How about baking her something special instead of buying something? I know french macarons may look intimidating to make, but if I can make them while being interrupted fifty times by a four year old, you can certainly make them. These Hazelnut Caramel Coffee Macarons are worth the effort. 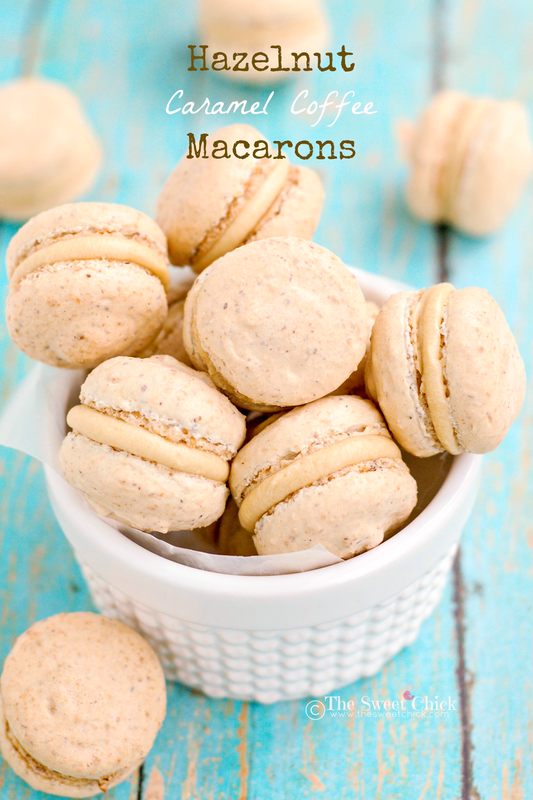 They taste like one of those ridiculously expensive gourmet flavored coffees and they are so light and airy, you can't eat just one. I know my mom would love to receive these on Mother's Day. In between all the rain showers, we have had some pretty nice days. This past Sunday was one of them. My husband and I actually took the kids to our community pool. They have been begging to go since it opened April 1. Only the neighborhood kids ventured out into the not so warm water. The adults were all lounging around in the hot sun. I am looking forward to some summer weather. 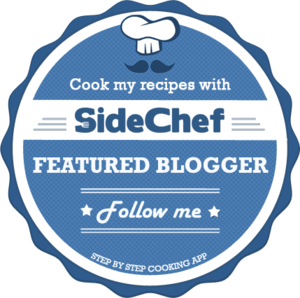 For now, I will have to do with some summer inspired treats. 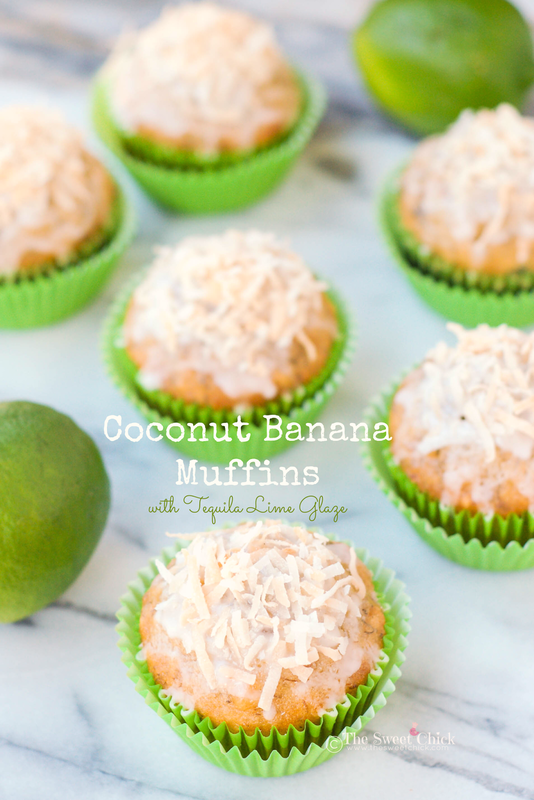 These Coconut Banana Muffins with Tequila Lime Glaze fit the bill perfectly. Have you guys tried the Cotton Candy flavored Oreo cookies yet? They aren't bad. My kids love them. The cream does taste like cotton candy, but not overly sweet. I thought I'd make them even better by turning them into truffles. I even made some cotton candy flavored candy melt to cover them in. 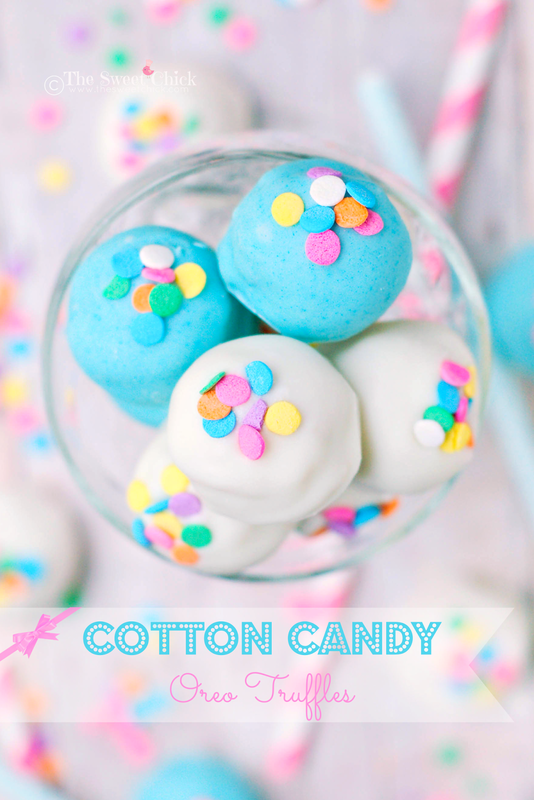 These Cotton Candy Oreo Truffles could be a hit at your kid's birthday party. Or you could just keep them all for yourself. Most people go south for spring break, but we went north. It was nice to spend Easter with our family and see our friends, however, I could have done without the cold rainy weather. We had a few warm, sunny days when we got back home, and it felt so good. Then the weather took a turn and we are back to cold, rainy weather down here too. Yuck! 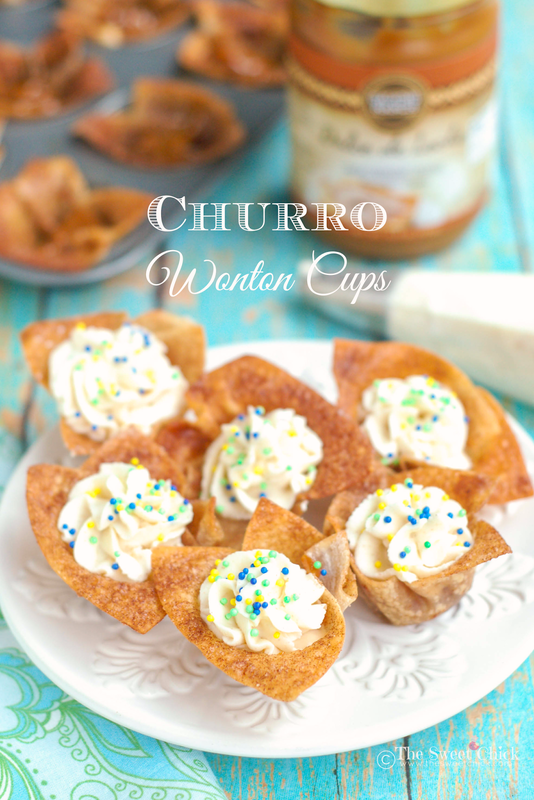 I needed a little pick-me-up to get me through this dreary week, so I made these cute, little Churro Wonton Cups. They are kind of like the Churro Puff Pastry I made two years ago, but crunchier. 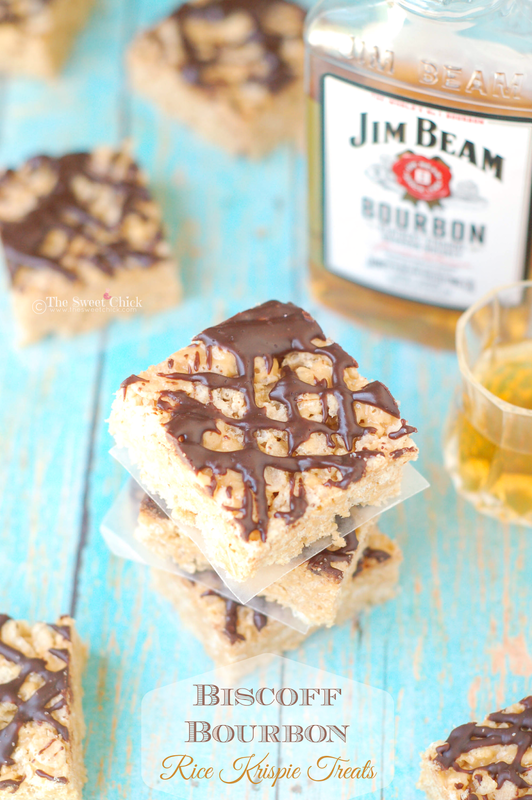 There are just never enough churro recipes in this world. 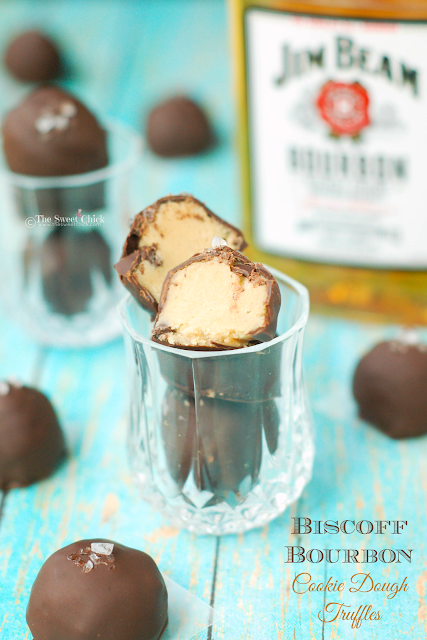 These are great for any Cinco de Mayo parties you may have coming up or just as a sweet pick-me-up to brighten your day. I can't believe Easter is just around the corner. I still have a lot of prepping to do, but I took a break to make some scones. 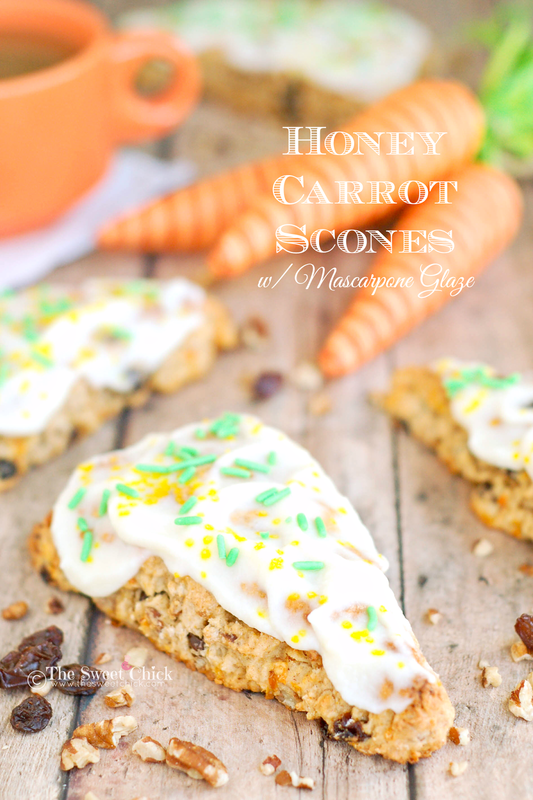 These Honey Carrot Scones with a Mascarpone Glaze are perfect for an Easter brunch or any day for a coffee break. 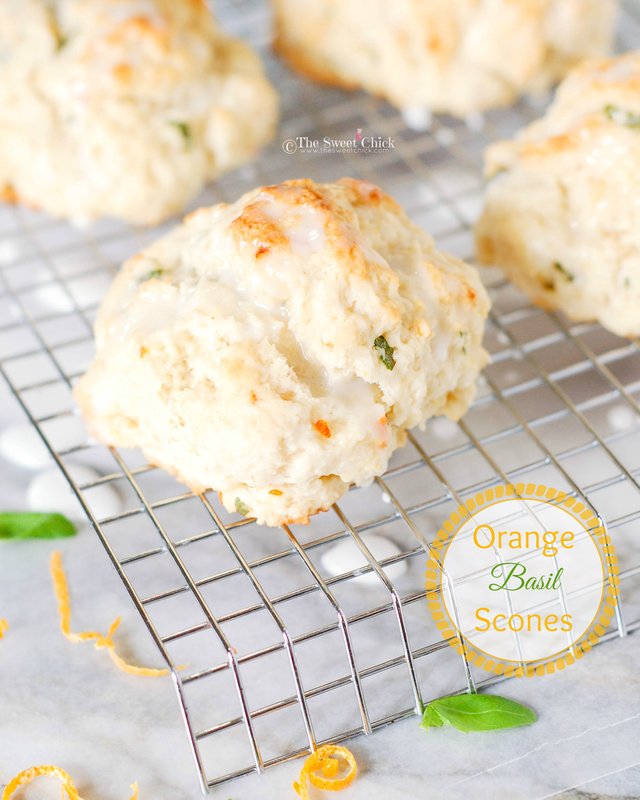 They are sweetened with honey and are chock full of carrots, raisins, and pecans. 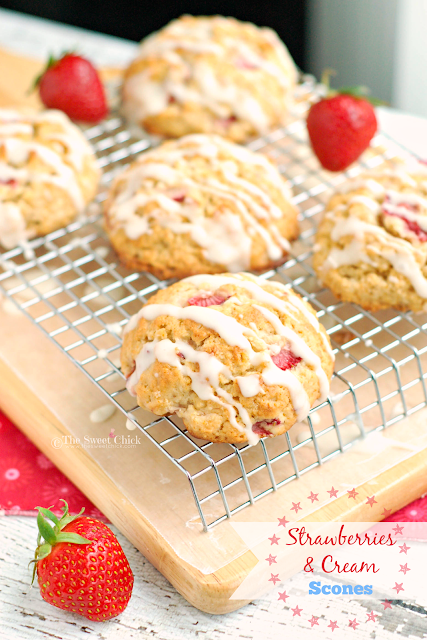 The mascarpone glaze is to die for and perfectly compliments the scones. These were a winner in our household over the weekend. Last week was not a good week. 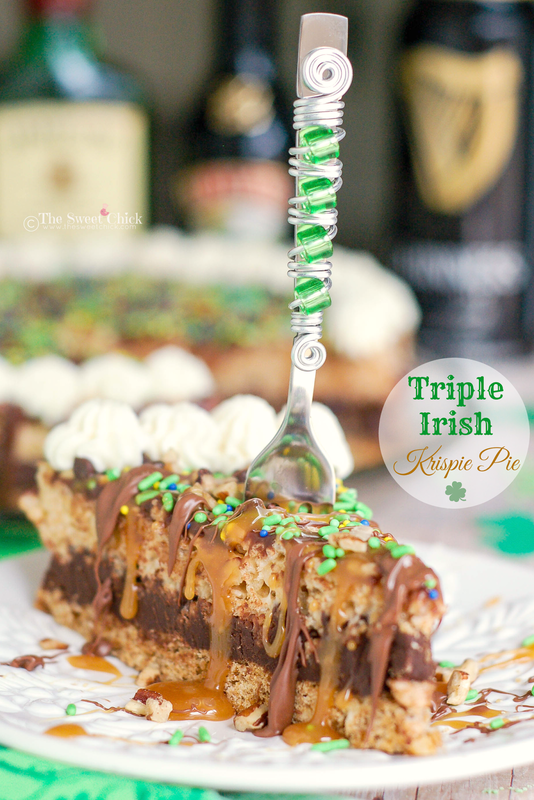 I was all excited about baking with Guinness again, but both recipes I was trying to develop failed and one I even tried twice. I was very disappointed to say the least. What a waste of good beer. So I gave up and made muffins instead. 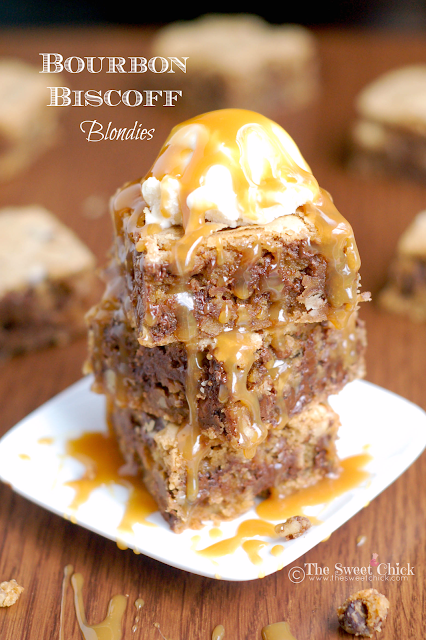 Of course, I did throw some Guinness in them, so they are not completely healthy. But hey, we can't all be saints. Some of us have to be sinners. 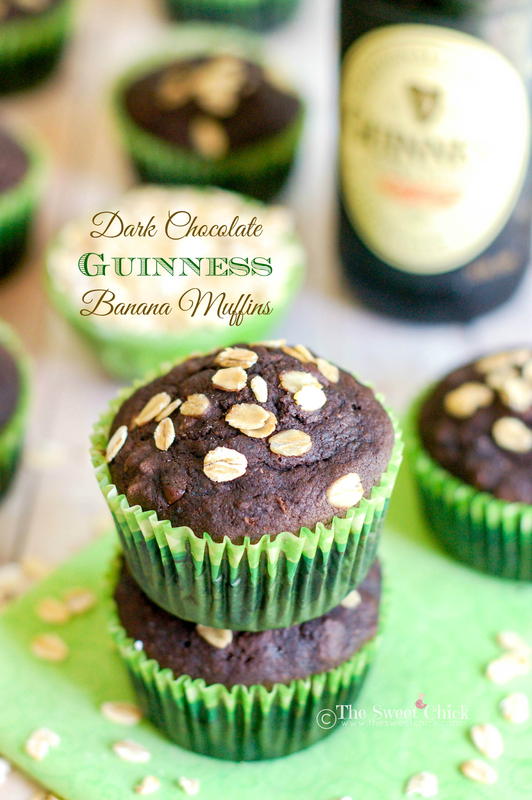 Even more sinful, is the fact that I also made an insanely delicious whipped butter spread to go with these Dark Chocolate Guinness Banana Muffins that has a bit of Baileys Irish Cream in it. Hey, if the Irish can put liquor in their coffee, I can put some in my muffins and butter. I hope everyone had a fun-filled Valentine's weekend. My husband and I spent the weekend with the kids at Legoland. Not very romantic, but it was fun. At least the parts where my four year old didn't take off on us or throw a fit when he didn't get his way. Such is life with kids. I am happy to be home in my own bed and cooking fresh meals again. 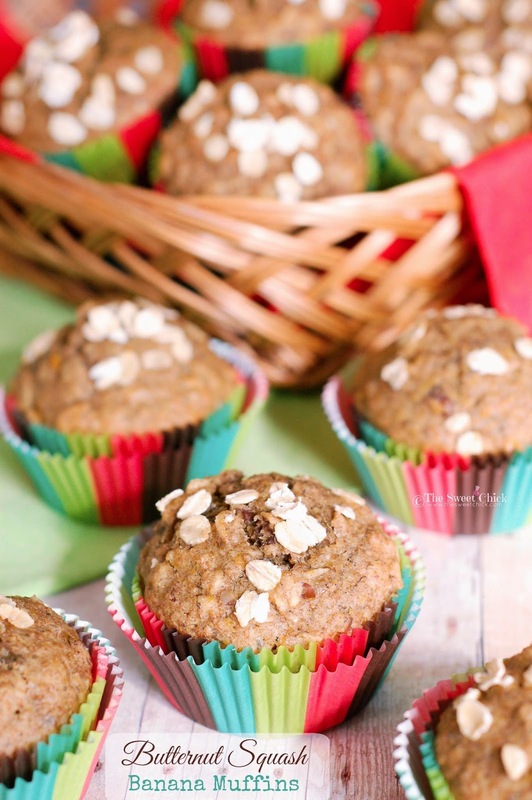 We had a lot of fast food at the park and on the road, but now it's back to healthy eating, like these Maple Ginger Banana Muffins. I kept wanting to try making these during the holidays, but never got around to it. I figured now was as good a time as any. I am still on a red velvet kick. 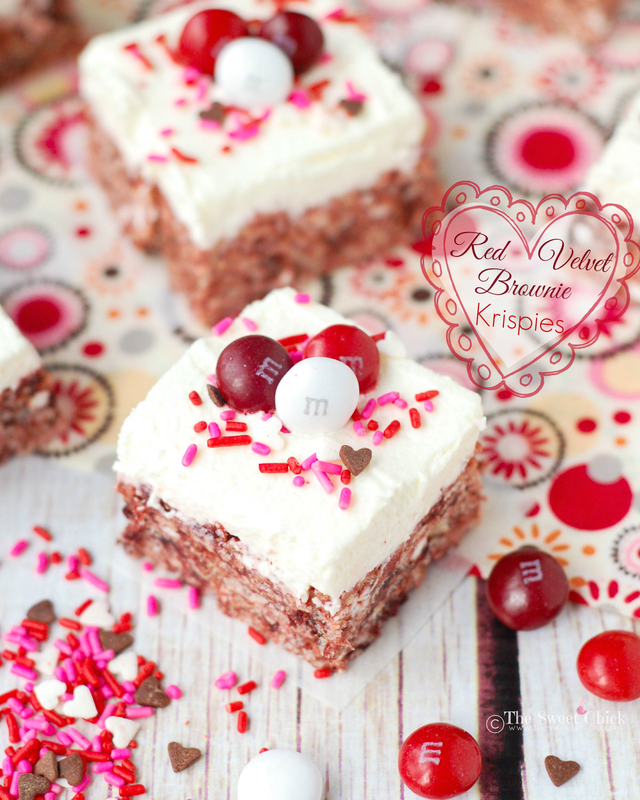 I had bought a box mix to make a red velvet cake for Valentine's Day, but then decided to use it to make some fun cookies. 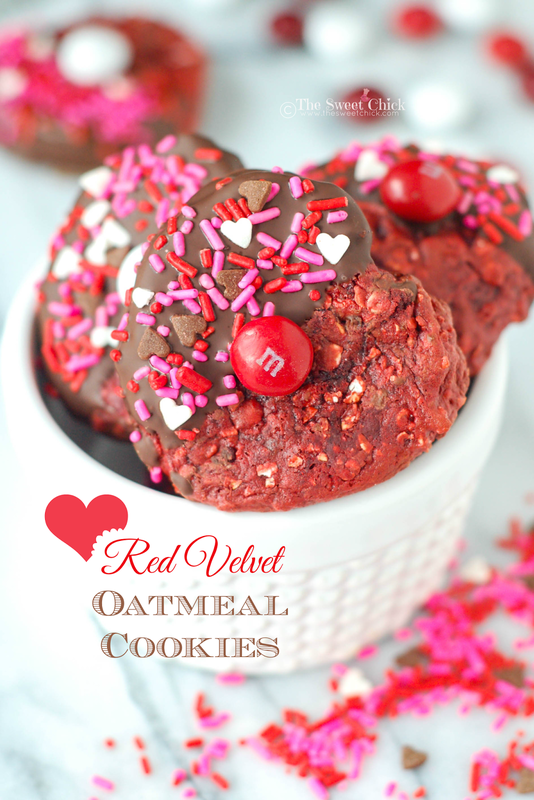 I had seen recipes for red velvet banana bread and red velvet oatmeal cookies, so I kind of combined the two and made these with Red Velvet Oatmeal Cookies with bananas. 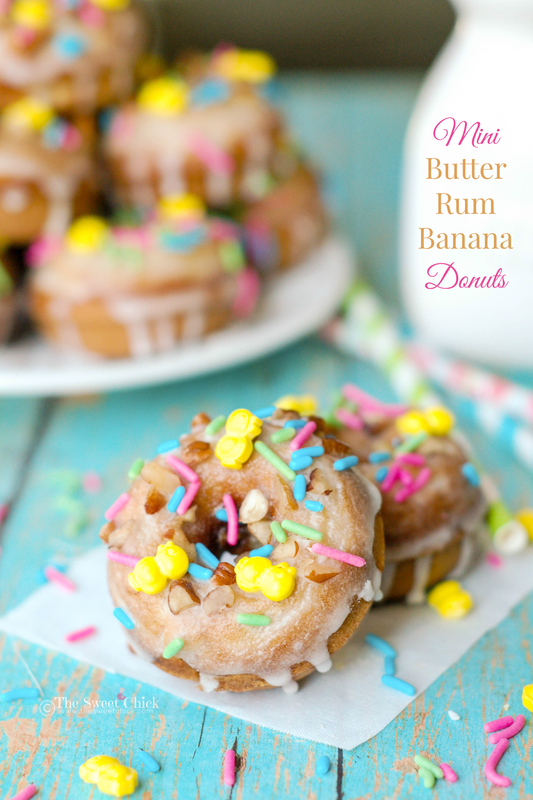 I wasn't too sure about the taste of bananas and red velvet together, but O.M.G, these came out so good. 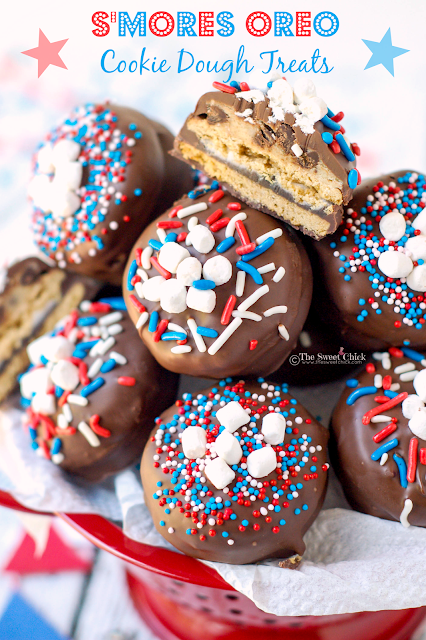 They even have a double dose of chocolate with semi-sweet chocolate chips inside and half-dipped in dark chocolate on the outside. I even threw in a Red Velvet M&M for decoration. 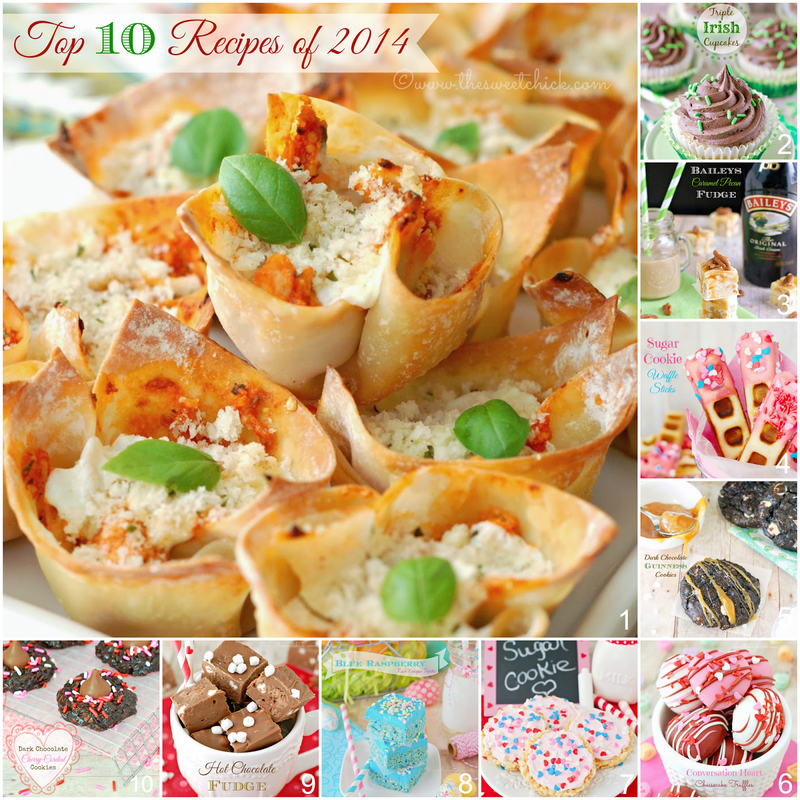 Well, if y'all are interested in knowing what Sweet Chick recipes were most popular in 2014, here they are. 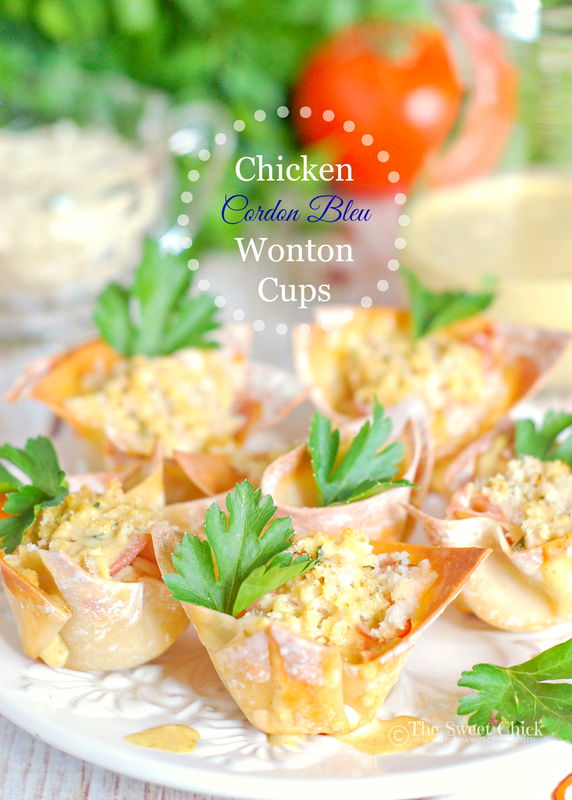 And while nine out of ten recipes were sweet treats, the number one most viewed recipe was the Chicken Parmesan Wonton Cups I made during Superbowl season last January. They were pretty awesome. I think I am going to make some more for this year's party. I hope everyone had a delightful New Year. Mine was pretty adventurous. My husband, our two kids, and I drove up 14.5 hours to Connecticut to visit our families, then I took the kids on another 6.5 hour ride to Canada to see my grandma, aunts, uncles, and cousins. Thankfully the kids were terrific on both trips and they loved seeing everyone. The weather, on the other hand, was not so terrific. I had forgotten how cold it gets up there. 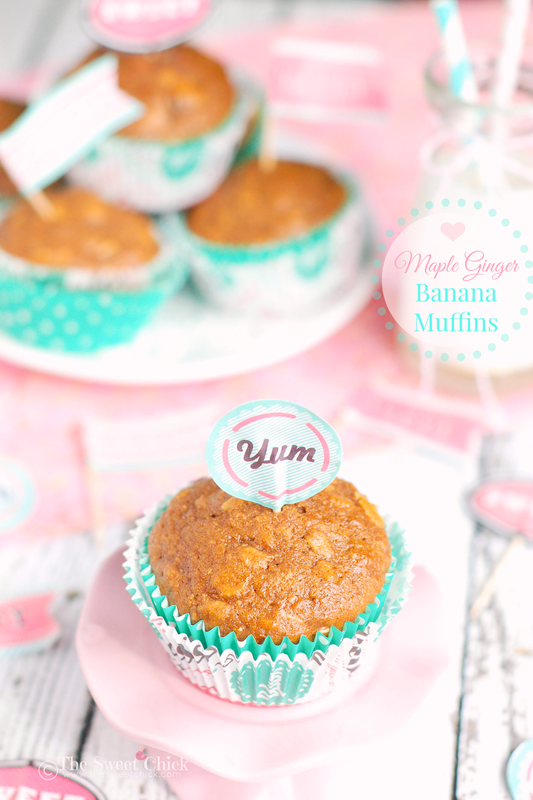 But now I am back home, keeping warm with a cup of coffee and these Butternut Squash Banana Muffins.